The size of England's backroom staff has often been questioned, with sometimes the same number of coaches, fitness experts and analysts as there are players on a tour. Justification came in emphatic style with the 3-1 Ashes success where the planning and preparation behind scenes left them well ahead of Australia and now a familiar philosophy is being taken towards the World Cup. 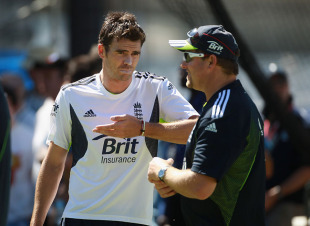 Beyond Andy Flower, the team director, one of key figures in the support team has been David Saker, the Australian-born bowling coach, who moulded England's pace resources into a powerful Test unit. Now, after using his local knowledge of playing in the Sheffield Shield for Tasmania and Victoria, he hopes his IPL experience with Delhi Daredevils before working with England will boost the team's chances of a maiden World Cup title to sit alongside World Twenty20 and Ashes success. "It will be different, there's no doubt, and we have to adapt our styles a little bit," Saker said. "Developing different balls for the subcontinent is something that's very important for us. The wicket we played on at the MCG was similar to a subcontinent pitch so we learnt something out of that. I've had some good experience out there in the IPL. I'm confident the attack we'll take will be good enough." The immediate success of Tim Bresnan and Chris Tremlett when they were drafted into the Test line-up wasn't a fluke or accident; it came from the hard work done by Saker to ensure the back-up players were ready at a moment's notice. He has signed a new three-year deal with the ECB and has been rightly lauded for his efforts which have included overseeing James Anderson's rise up the world rankings and Tremlett's re-emergence on the scene as a top-quality Test bowler. The failure of the attack to defend 294 in the first ODI in Melbourne doesn't detract for Saker's efforts. The difference between the England and Australia attacks was stark with the hosts' bowling looking weak apart from the third Test in Perth. England found ways of striking with the old ball - reverse swing being a key weapon - and often kept the scoring rate below three-an-over. It came as little surprise when stories emerged of Australia wanting to try and entice Saker back into the vacant bowling coach role that used to be Troy Cooley's, but he had no plans to go anywhere. "I think it was just because the Australian job was coming up there was talk about it. No one from Cricket Australia approached me, it was mainly hearsay," Saker said. "I was probably never going to consider leaving England, they gave me a great opportunity at international cricket so I wasn't going to jump ship after just 12 months. I'm really happy with the group and it's a great working environment." However, Saker doesn't want the credit for England's success and is adamant the results have been because of the talent at his disposal. "It's been extremely flattering but I think a lot of the praise should go the bowlers, all of it really," he said. "We had some plans in place, myself and the other coaches, and the bowlers executed them really well. Coaches are only as good as their players. We put some really good things in place, but they were outstanding with their skills." The depth of England's resources were crucial in the Ashes, meaning they could cover the loss of Stuart Broad through injury and replace Steven Finn after three tough Test matches. A similar state of readiness will be vital over the next three months of one-day because, as with the Test team, there will be the need to make changes. Ajmal Shahzad is leading the race to be England's back-up quick in the World Cup and Saker has been impressed with his performances after sitting on the sidelines during the Ashes. "There have been some good signs, Shahzad has bowled really well in the two T20s and I thought he did a really good job the other day. Chris Tremlett also did some good stuff. As we know Shane Watson's innings [161 not out] was pretty special and it wouldn't have mattered who was bowling the way he was playing." Another player who has earned positive reviews, and pushed himself into the World Cup frame, is Chris Woakes. He played both Twenty20s against Australia, hitting a match-winning 19 at Adelaide to secure a one-wicket victory, but was dropped in favour of Tremlett for the MCG one-dayer. "He's been fantastic," Saker said. "He's been very good with the ball but with the bat he's shocked everyone with how cool he's been. If you can have more elements to your game other than bowling you become a valuable package. He bats well, he bowls well and he's fields very well. The future for him looks good." This World Cup is likely to be a little too soon for Woakes, but in Saker he has an ideal coach to help him develop over the next few years.